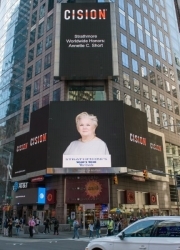 Burtonsville, MD, August 28, 2018 — Annette C. Short of Burtonsville, Maryland has been honored on the famous Reuters Billboard in Times Square in New York City by Strathmore’s Who’s Who Worldwide for her outstanding achievements and high level of success for over 20 years in the field of medical diagnostics. Annette Short is the Regional Manager of Business at Laboratory Corporation of America, which is a national company providing medical diagnostic services. She trains representatives in molecular diagnostics and pharmacogenomics. Born on June 19, 1955 in Sioux City, Iowa, Annette obtained a B.S.N. from Columbia Union College in 1978. She is affiliated with the A.S.M.G. She was recently featured on the famous Reuters Billboard in Times Square in New York City. In her spare time Annette enjoys riding horses, and arts and crafts. For further information, contact www.labcorp.com.